The first reviews of Google's latest version of Chrome OS are out. 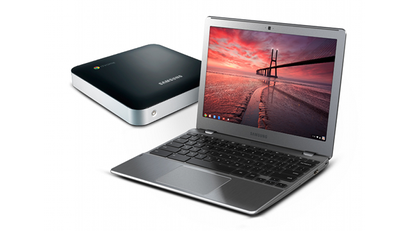 Several publications took the cloud-based OS for a test drive on the new Samsung Series 5 Chromebook and Series 3 Chromebox. The consensus so far? Chrome OS Verion 19 is fast and takes some important strides towards delivering a fully functional, browser-based OS. But still, even with the performance enhancements and $US450 hardware, it's not quite ready for primetime. The Chromebook's hardware still feels a bit lackluster. The build quality and display are adequate without being anything special, and I prefer some of the design touches from the last-generation Chromebook. For the $US449 price, though, you can get a pretty good Windows laptop, so you have to consider the tradeoffs. The Chromebook has great battery life, solid performance, and fantastic start-up time, but Windows still offers a world of apps and use cases that Chrome OS can't match. Google is closer than ever to convincing the world that we can live online, that we can do away with the old hard drives and local apps and spend our lives on the web. If you're shopping for a dead-simple computer to use as a secondary machine or to give to someone with only basic computer needs, the latest Chrome OS machines are worth a long look. One of the best we've tested lately. Seriously, folks, you're looking at a $US449 netbook-like machine whose island-style keys put thousand-dollar Ultrabooks to shame. Compared to Samsung's own Series 9 laptops and other ultraportables, the chiclet keyboard on offer here actually has some bounce to it. The slightly deeper keys and even the quiet sound make it easy to settle in for hours of web surfing, email and story writing (well, if you're an Engadget editor, anyway). The good news is that Google's taken a half-baked, experimental product and done an admirable job of fleshing it out. After spending a few days testing the software, we can confidently say that multitasking is a lot easier when you can view multiple windows onscreen at once, and when you have shortcuts pinned to the bottom of the screen, below the browser. It's also hugely helpful to be able to edit documents offline instead of just view them. Ditto for being able to read books offline, or use Hangouts for video chat instead of the calling feature built into GChat. It is screamingly fast. Both the browser launch and browsing itself take advantage of improved hardware, graphics and most importantly the underlying OS. The trackpad, which used to have the responsiveness of a piece of wood, feels like a trackpad on any modern laptop. There are enough apps to actually use the device for more than a few mundane tasks, such as browsing and email. The Chrome OS has a long way to go before it's ready to challenge Windows or Apple's OS X - after all, you can only run web-based browser apps on the platform. Nonetheless, the new desktop interface (which allows for true multitasking), as well as updates on the roadmap, should continue to nudge Chrome OS toward greater relevance and utility. Here's the biggest problem with the Chromebook: the hardware's fine, and the simplified Web-based OS is clever, and even versatile if you don't mind its limitations. Still, it's a radically reduced subset of what you can get on a Windows or Mac laptop...or even an iPad or Android tablet, for that matter. And yet, it costs more than a new iPad 2, a thinner, keyboard-enabled Android tablet like the Asus Transformer Pad, or a fully featured 11-inch ultraportable laptop like the AMD-powered HP dm1z. If the Chromebook were $US99, this could have been a revolutionary product. As it currently stands, it's merely an invitation to pay a lot of money to be part of a Google experiment. And you're the test subject. As before, set-up is dead simple. You choose your language and network for connecting online, enter your Google (Gmail) credentials and you're pretty much good to go. Your bookmarks and open tabs for Web pages on any other computers you have with the Chrome browser should be synced up. And this time around, though, the Chromebook experience is generally more polished.